Traders have always wanted to know, “Where are the odds going and how much risk am I taking?” Now, thanks to Tennis Trader from Bet Angel, you can have all the answers in real time right in front of you on your trading desk. No longer do you need to guess where the odds are going, Tennis Trader will tell you! Tennis is one of the most popular trading markets on Betfair thanks to the large amounts of volatility that occur. This produces significant trading opportunities in a lot of matches. Catch a good move and you can make good money, but a wrong one can cost you a lot. 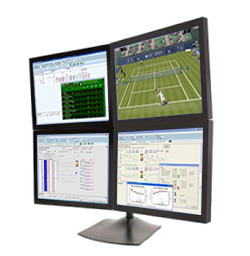 Tennis Trader will transform your trading. Best of all Tennis Trader is free with Bet Angel Professional.